From the start the French colony in North America, called New France, differed from the British colonies. Typical French colonists were young, single men who engaged in the fur trade and Catholic priests who sought to convert Native Americans. The French were more interested in exploit- ing their territories than in settling them. However, they usually enjoyed better relations with Native Americans, in part because they needed the local people as partners in the fur trade. In fact, several military alliances developed out of the French–Native American trade relationship. One major area of contention between France and Great Britain was the rich Ohio River valley just west of Pennsylvania and Virginia. In 1754, the French built Fort Duquesne in the region despite the fact that the Virginia gov- ernment had already granted 200,000 acres of land in the Ohio country to a group of wealthy planters. In response, the Virginia governor sent militia, a group of ordinary citizens who performed military duties, to evict the French. This was the opening of the French and Indian War, the fourth war between Great Britain and France for control of North America. In the ﬁrst battle of the war, the French delivered a crushing defeat to the out- numbered Virginians and their leader, an ambitious 22-year-old ofﬁcer named George Washington. A year after his defeat, Washington again headed into battle, this time as an aide to the British general Edward Braddock. 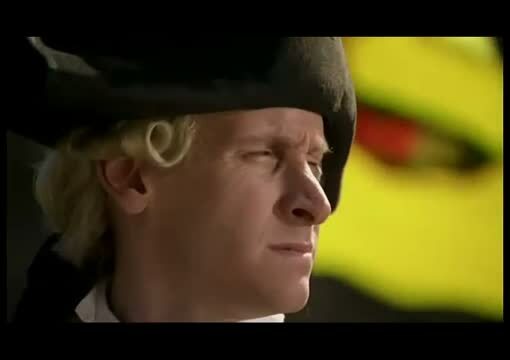 Braddock’s ﬁrst task was to relaunch an attack on Fort Duquesne. As Braddock and nearly 1,500 soldiers neared the fort, French soldiers and their Native American allies ambushed them. The startled British soldiers turned and ﬂed. The weakness of the British army surprised Washington, who showed great courage. As Washington tried to rally the troops, two horses were shot from under him and four bullets pierced his coat—yet he escaped unharmed. Many other colonists began to question the competence of the British army, which suffered defeat after defeat during 1755 and 1756. Angered by French victories, Britain’s King George II selected new leaders to run his government in 1757. One of these was William Pitt the elder, an energetic, self-conﬁdent politician. Under Pitt, the British and colonial troops ﬁnally began winning battles. These successes earned Britain the support of the powerful Iroquois, giving Britain some Native American allies to counterbalance those of France. In September 1759, the war took a dramatic and decisive turn on the Plains of Abraham just outside Quebec. Under cover of night, British troops scaled the high cliffs that protected the city and defeated the French in a surprise attack. The British triumph at Quebec brought them victory in the war. The war ofﬁcially ended in 1763 with the signing of the Treaty of Paris. Great Britain claimed Canada and virtually all of North America east of the Mississippi River. Britain also took Florida from Spain, which had allied itself with France. The treaty permitted Spain to keep possession of its lands west of the Mississippi and the city of New Orleans, which it had gained from France in 1762. France retained control of only a few islands and small colonies near Newfoundland, in the West Indies, and elsewhere. Led by Pontiac, Native Americans captured eight British forts in the Ohio Valley and the Great Lakes area and laid siege to another. In response, British ofﬁcers deliberately presented blankets contaminated with smallpox to two Delaware chiefs during peace negotiations, and the virus spread rapidly among the Native Americans. Weakened by disease and tired of ﬁghting, most Native American groups negotiated treaties with the British by the summer of 1766. To avoid further costly conﬂicts with Native Americans, the British govern- ment prohibited colonists from settling west of the Appalachian Mountains. 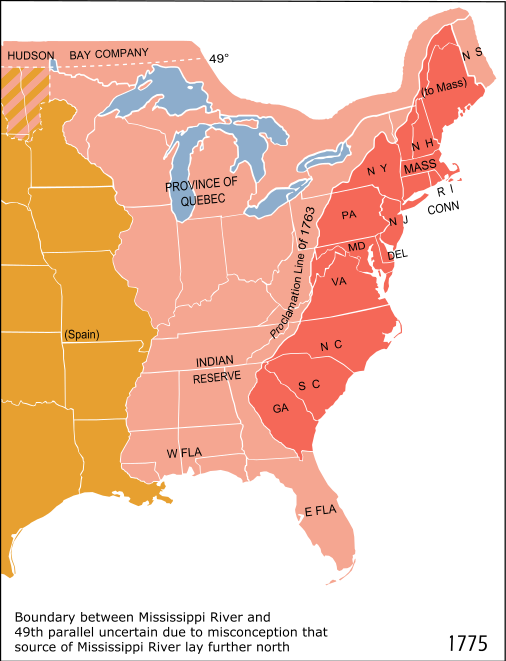 The Proclamation of 1763 established a Proclamation Line along the Appalachians, which the colonists were not allowed to cross. However, the colonists, eager to expand westward from the increasingly crowded Atlantic seaboard, ignored the proclamation and continued to stream onto Native American lands. Despite facing such a formidable alliance, British naval strength and Spanish ineffectiveness led to British success. British forces seized French Caribbean islands, Spanish Cuba, and the Philippines. Fighting in Europe ended after a failed Spanish invasion of British ally Portugal. By 1763, French and Spanish diplomats began to seek peace. In the resulting Treaty of Paris (1763), Great Britain secured significant territorial gains in North America, including all French territory east of the Mississippi river, as well as Spanish Florida, although the treaty returned Cuba to Spain. Unfortunately for the British, the fruits of victory brought seeds of trouble with Great Britain’s American colonies. The war had been enormously expensive, and the British government’s attempts to impose taxes on colonists to help cover these expenses resulted in increasing colonial resentment of British attempts to expand imperial authority in the colonies. British attempts to limit western expansion by colonists and inadvertent provocation of a major Indian war further angered the British subjects living in the American colonies. These disputes ultimately spurred colonial rebellion, which eventually developed into a full-scale war for independence. Because the Proclamation of 1763 sought to halt expansion by the colonists west of the Appalachian Mountains, it convinced the colonists that the British government did not care about their needs. A second result of the French and Indian War—Britain’s ﬁnancial crisis—brought about new laws that reinforced the colonists’ opinion. The War as well as the Treaty also created a NEED for England to spend more Money and Time in administrating her colonies. The new role would produce a great financial strain on the English and would result in a direct change in their American colonial policy. The new, far larger dominion would be much more expensive to maintain and England's national debt had doubled between 1754 and 1763. Now this debt must be serviced and repaid, and the strain that this would place upon the economy was clear to all. Furthermore, the day-to-day cost of administering an empire which extended from Canada to India was far larger than that which the English taxpayer could be expected to bear. Before the war the cost of administering the English colonies in North America was about 70,000 a year; after the war it climbed to 350,000 a year. The reason for the increase was that England's American empire had almost doubled in size and complexity. An administrative system which treated it like a string of separate colonies struggling to exist would no longer suffice. The new holdings would have to be integrated into the empire, administered in accordance with imperial policy, and defended against the possibility of a renewed French or Native American threat. As a result of all this, England was forced to end her neglect of her colonies by enforcing a more vigorous mercantile policy which made the colonies PAY for themselves. British officials were also distressed by the reluctance of the colonists to support the war. During the war, American shippers using fraudulent papers developed a very profitable traffic with the enemy ports of the Spanish and French West Indies. This treasonable trade in foodstuffs actually occurred at the same time the British navy was trying to subdue them. By the end of the war the English authorities were forced to halt all supplies from New England and the Middle Colonies. It appears that the colonists demanded the rights and privileges of Englishmen, without the duties and responsibilities of Englishmen. The American's attitude toward England was profoundly affected after the removal of the French threat in Canada. While the French threat had been hovering in the North and West, the colonists had been forced to cling close to the wings of the mother hen. Now that the threat had been removed they developed a NEW SPIRIT OF INDEPENDENCE. The efforts that were undertaken to change the system provoked a major crisis within the British Empire. The colonists realized that their welfare was not a fundamental consideration for the English and that they, for all practical purposes, had become independent on their own during the years preceding the French and Indian War. This realization led to the American War for Independence when England tried to enforce her new policy of ending "salutary neglect."